The fifth installment of the What Lies Beyond Reason AP clocks in at 102 pages, 1 page front cover, 1 page editorial, 1 page KS-backer thanks, 1 page ToC, 1 page SRD, 1 page back cover, leaving us with 96 pages of content, so let’s take a look! This is my review of the updated v.1.1. version. All right, so, formally, this installment of the AP is intended for 7th level characters, but it should be noted that the adventure does provide guidance on running this for 6th and 8th level characters as well – we get some global advice on quick and painless scaling here. It should also be noted that this module works better as a stand-alone adventure than most installments in the series so far, so, if you’re looking for a module to scavenge without the epic plot the series has so far woven, this is very much possible. (Then again – particularly the last adventure really paid off big time for all the setting of the stage, so you may want to reconsider that…) Anyways, in such a case, or if a PC did not live past the events in module number #4, you’ll be happy to note that the adventure comes with 5 pregens, all of whom do receive a bit of character background, their own, full-color mugshot, etc. Now, before I go into the details, there is something that better encapsulates how this adventure feels than many a sentences, at least for the folks who know what I’m talking about: As the author clearly states in the introduction, this is pretty much a homage to “Against the Giants” in its style, in that it tries to present an environment that makes sense; not in a realistic way, mind you, but in a plausible, fantastic manner that renders the playing experience as dynamic as can be. In other words, this module is very much a living sandbox, wherein there are plenty of ways to get to the goal. It should be noted that, unlike many a sandbox, this is still a very much story-driven module, and as such, it features copious amounts of well-written read-aloud text. Before we dive into the plot, let us talk a bit about the 5e-rules and conventions herein. I should be noted that a persistent formatting convention of 5e hasn’t been properly implemented – 5e tends to italicize and bold character and monster abilities; this module only bolds them. Furthermore, the “Hit:” before the damage values of attacks is consistently not properly italicized. These are consistent, though, so not a big issue, apart from aesthetics. However, e.g. the magic items herein (there are a couple of artifacts) don’t italicize a couple of spell references. Furthermore, some of these spells have variable effects depending on spellslot used, and it’d have been nice to see that acknowledged by stating as what slot they’re considered to be cast. While defaulting to the basics is simple enough, this does represent a downside. On the plus-side, item scarcity and attunement, if required, is noted properly. A nice plus: We do get some stats for a couple of siege engines in 5e, as well as stats for an airship. A bigger plus that applies throughout: Items, doors and the like have both AC and damage threshold, HP, etc. noted. Similarly, damage types have been properly converted, and e.g. the statblocks, apart from the formal deviations that are primarily cosmetic, actually make good use of Recharge, attack values are consistent and correct, proficiency modifiers are applied correctly. Poison damage is used correctly – and the BBEG gets legendary actions and lair actions. Both of which are tightly codified. Minor complaint in an otherwise nice array of stats: The BBEG’s Strength saving throw value is off by 1. It should be +11, not +10. This is a minor hiccup in what may otherwise by the most mechanically precise and well-crafted such section in the AP, though. In short: If formatting deviations irk you, this may annoy you. If you place a greater emphasis in the content itself, this will probably make you smile instead. The following text will discuss the module in detail; it will not only contain SPOILERS for this module, but it might also casually link back to proceeding events in the AP. If you wish to play this, then stop reading NOW. From here on out, only GMs should continue reading. All right, only GMS around? Great! So, in the aftermath of module #4, things have radically changed for the heroes – they have unearthed widespread corruption, made a name of themselves, and indubitably unearthed the signs of a vast warding ritual to be prepared – but by what degree they have truly shared their information and made the right deductions remains very much modular and will influence the outcome of the campaign and behavior of the NPCs within. The metropolis Anduria faces a demand for silver, and with the epidemic of madness spreading, the wards discovered in the last module may make for the best bet to return the metropolis to its proper power and confidence. In the aftermath of healing, unreliable and tainted though it may have been, gone, and the issues with certain Asmodeus-worshiping folk, the city needs heroes – which is why the PCs are asked to conduct an investigation into the very well-timed and rather convenient shortage of silver coming from Anduria’s most reliable source – the aptly-named town of Silverton. Thus, the PCs are to charter an airship en route to the town (or travel on foot, depending on how well they fare…) and look into the matter themselves…the guard has justifiably become paranoid of certain figures, and the head of the Merchant Guild, one Veranion, does come off as suspicious. 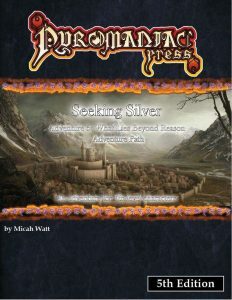 En route to Silverton, the PCs get to experience a scripted combat in the distance, an aerial combat that sees a silver dragon snared by griffon-riders and even a giant – the PCs will have the chance to ignore the silver dragon, and leave Silvirantalas, “Silvira” for her friends, to a grisly fate, or save the severely wounded dragon – who has bad news. Silverton has been taken, and her mate as well – and oddly, someone seems to be able to locate her. This is not paranoia, mind you – she is correct. Silverton has been taken by an infernal conqueror, a devil obsessed with silver known as the Silversmith, and the keep at the heart of the town, with its massive chimneys, really evoked a sense that the settlement has gone full-blown Isengard. Massive walls and keep, forged by a mighty artifact, a massive occupying force, and a resistance – the town of Silverton is a sandbox in the truest sense of the way: Attack, infiltration and stealth are all valid means to tackle the issues in the town. The town comes with a couple of keyed locales, but ultimately, most groups will realize that checking out the mine (and potentially liberating it) may be a smart move – as such, it comes fully mapped and makes for a fun sub-dungeon of sorts. Ultimately, though, the goal is to infiltrate the massive, multi-level keep and deal with the Silversmith…and the keep is ginormous. It has a lot to find, and from global terrain effects to the peculiar, it has quite a lot to offer regarding dangerous, storied items – like the Hand of the Undying King or the Crown of Ghelgar, Last King of Anduria, but ultimately, I can only provide a very brief glimpse of what you can find here: There are plenty of named NPCs that behave in a sensible manner; from the battlements to the smothering foundry, there are a ton of variables here, which made me, indeed, recall Against the Giants. Exploring the entirety of the keep is a daunting endeavor, and one that will be strenuous to say the least, if your PCs think they can just mow their way through the adversaries. Also rather cool: There is a means to once more confront Damien, and while he seems to be working with the enemy here, there is a good reason for him doing so: He has started to glimpse the truth of the greater plot aimed to plunge Anduria into chaos, and while his choice of methods and allies leaves something to be desired, to say the least – still, the focus of player-agenda and dynamic NPCs remains, and whether he is a boss or a potentially redeemable ally, is wholly contingent on the PC’s actions. And yep, previous actions do tally up, which adds further gravitas to the actions of the PCs. Kudos! This modularity also accounts for a potential capture of the PC’s new draconic ally, to note another possible outcome – though one with grim consequences. Ultimately, though, the goal here is to defeat the Silversmith – and she is a deadly foe, courtesy of the transformative properties of the anvil of kings, one of several artifacts that the PCs can potentially get within – while these are very potent, they do come with a price. If the sheer number of NPCs may seem daunting at first, rest assured that the module does contain a handy name-allegiance-motivation cheat-sheet that allows you to keep track of allies and enemies of the PCs alike. In direct comparison to the PFRPG-version, I think the items within work better here – while aforementioned spell-use components can be considered to be a detriment, as a whole, this section works mechanically smoother with 5e. Editing and formatting are pretty much upside down from the Pathfinder version: The formatting conventions herein, as noted in the beginning of the module, are pretty much inverse from the Pathfinder version – the module’s 5e-iteration sports a couple of formal deviations from conventions, but gets the rules in the details tighter than the PFRPG-iteration did. Personally, this makes the module’s 5e-iteration the superior version for me. Layout adheres to a two-column full-color standard, and it should be noted that the adventure sports quite a few really impressive original full-color artworks. Particularly the vista of Silverton, and the BBEG’s pictures are amazing. The pdf comes fully bookmarked for your convenience. An epic aspect of this one would be the maps: The pdf comes with no less than 8 different, player-friendly maps, fully VTT-compatible. The maps are beautiful, plentiful and the amount of support here deserves two thumbs up. Micah Watt’s “What Lies Beyond Reason” is a series that should not, by any means, work as well as it does. What Do I mean by this? Know what’s really, really not conductive to horror? High fantasy. Being essentially a superhero deprives you of the sense of vulnerability and unease that lies at the foundation of most horror games and modules. There is a reason for e.g. LotFP-offerings focusing on low level offerings, further reducing PC capabilities, etc. And indeed, this whole AP begins with a rather “as high as can be” fantasy with airships, weird characters, wonder, a magical metropolis…and then, it proceeded to provide a “vanilla” horror module of the first caliber with module #3, providing a change of pace and a first climax of sorts. The second arc of the AP, i.e. module #4 and this very one, manage to blend two things that should be contrary – by the medium of player agenda. There is a constant emphasis on player agenda, on reaping what you sow – and on at times merciless implementation of said consequences. This module can end in a cataclysmic way if the players botch it – and after providing the most “classic high fantasy” genre-piece of the AP so far, that contrast actually adds tremendously to the adventure. I noted that the module is a homage to “Against the Giants” – and the adventure actually succeeds in encapsulating this flavor, this level of density; it is a great sandbox that can easily stand on its own, even beyond the confines of the AP. That being said, the best thing about this module for me, ultimately, is that it represents a breather from the devastating consequences of module #4 within the context of this AP, all while setting the stage for the shape of things to come. This is most efficient as part of the AP, and it represents a massive gain in power and capabilities for the PCs – it adds a further set of variables to an already impressive tapestry of NPCs, consequences and decisions that have shaped the AP so far. If anything, this amount of variables really makes me excited for the furious finale of this AP, for the final arc of this saga. So yeah, this is definitely worth its asking price. This is, formally, the better version of the module, and the story here is compelling; the plausibility of Silverton and the adversaries herein is impressive, and while this may look like a sidetrek at first, the consequences and denouement in the aftermath bring the themes of the AP home once more – big time. This also extends to the role of recurring NPCs, and as a whole, this may be the “trip beyond the confines of the main locale”, the “change of pace” module, but it does its job significantly better than many comparable chapters in campaigns. The writing is atmospheric, fun and embraces its classic heritage. This is a resounding success as both a stand-alone adventure, and as a part of the AP – one that actually makes me much more excited for the finale of this saga than I was before! I can see the vast ambition of this series, and so far, Micah Watt has proven that he has the means, the narrative and design chops, to deliver a payoff for this epic. And considering the potent tools that the PCs may take from this, I am rather intrigued to see where this is going. This may not be formally perfect, but it has what many adventures lack – ambition, direction and vision. My final verdict for the 5e-iteration will clock in at 5 stars, as the content makes up for the few formal snafus. Did I mention that the PCs might get to go to hell in the aftermath of this module, quite literally? Completely optional, mind you! There. Ambition. Gaming needs it, and for that, I very much recommend you pick up the whole AP. We need great indie stories like this.